Mankind has celebrated Jesus’ life and expressed gratitude to Him for several thousand years, but this Easter, let’s remember our goal of living in Christ Consciousness! Swamiji challenges us in this video to expand our consciousness so that we are in Love all of the time. With everything we see, let’s see it through the filter of universal love. With every act we do, let it be done in service of our Beloved. Imagine how our lives would transform if we set this as a goal! Imagine what changes could be made for the betterment of the world if we viewed everything through the filter of Christ Consciousness! Living in Christ Consciousness is not only possible, but also inevitable as we continue our spiritual journey. Swamiji explains that Jesus is an excellent role model for us. Jesus lived with Universal Love all of the time – so much so that he even gave His life for His Beloved. In studying Jesus’s life, we find proof that it is possible for each and every one of us to live in Christ Consciousness. Jesus said we are all one family – we are all brothers and sisters. If one of us can live this way, certainly the rest of us can. 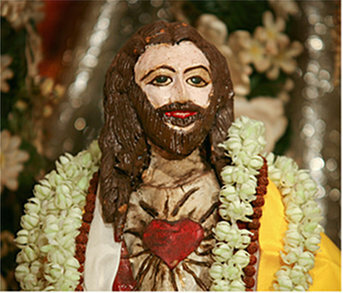 Watch this exciting video as Swamiji explains that Christ Consciousness is Universal Love!